One of Bill's very good friends, Peter Doctors, went camping at Yosemite and brought us back a beautiful large porcini mushroom. 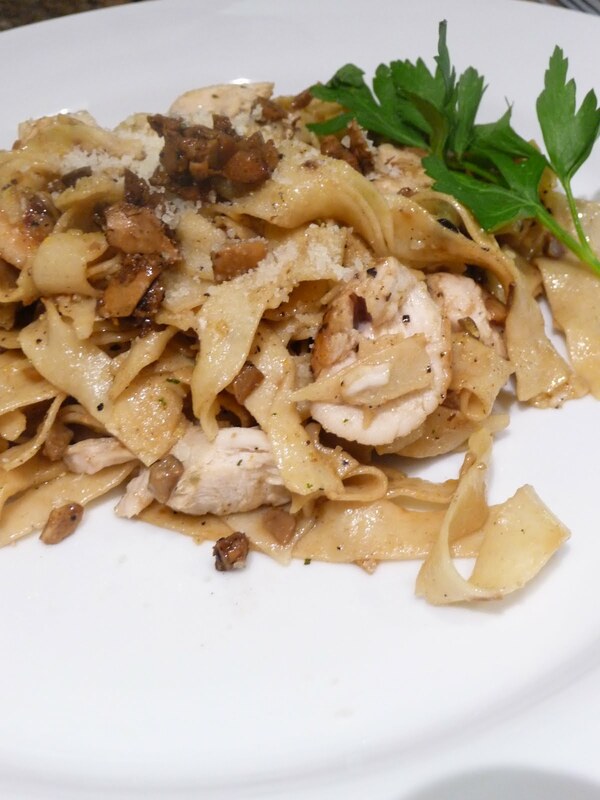 I was mulling over recipes that would be great with a porcini and thought a fettuccine would be perfect! This recipe isn't exact. I was throwing things in and didn't keep good track of the measurements. Heat 3Tb of olive oil in a large skillet over med-high heat. Add the chicken and cook until browned and thoroughly cooked set aside. In the same skillet add the mushrooms, a large pinch of salt and shake a generous amount of 21 seasoning salute (I use this seasoning on almost everything. It's a perfect blend of spices! If you don't have it I suggest you go get it from Trader Joe's.) Saute the mushrooms until they release their liquid and start to brown. Stir in the garlic and cook 1 more minute. Add the white wine and cook for about another 2 minutes, or until the wine is reduced by 1/4. Remove from heat and set aside. Bring a pot of water to a boil. Salt the water generously and cook the fettuccine about 3 minutes. Drain. Over low heat warm the mushrooms and add the fettuccine. Stir in the salt, pepper, chicken, cheese, lemon zest, butter and the remaining olive oil. Then stir in the cream. Garnish and serve!